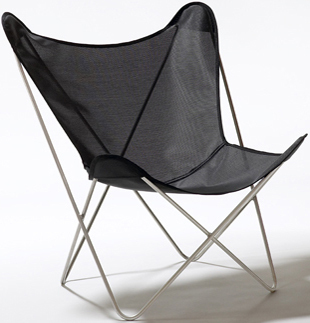 The Butterfly chair, designed in 1938 by Jorge Ferrari-Hardoy, also known as the BKF and the Hardoy chair, is available in matte black or stainless steel. To select a replacement cover for a vintage chair, measure your frame to determine the size that will fit best. Click any swatch below for large view. Our made-to-measure butterfly chair covers are made to your size, fabric and color specification. If your chair does not match one of our sizes, we will customize your cover at no additional cost. For instance, if your chair measures 32" across the back and 26" in front, we will combine our patterns to make a D/B cover to fit your frame. 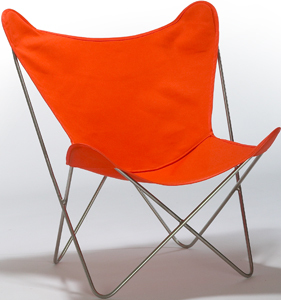 Selecting the size of your replacement cover: If your chair folds, order a size A replacement cover; otherwise, measure your non-folding frame as shown. Determine the widest span by measuring from side to side or from the peak of the bends, wherever it is the widest. Please call 1-877-247-2250 if you need help selecting the correct size. Design history: Designed by Argentinian architect Jorge Ferrari-Hardoy in 1938 while working for Grupo Austral, the chair was named BKF after his design partners, Antonio Bonet and Juan Kurchan. On July 24, 1940, it was first shown at the 3rd Salon de Artistas Decoradores in Buenos Aires. 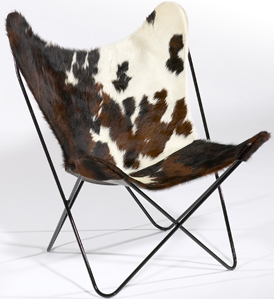 That year, MoMA design director Edgar Kaufmann Jr acquired them for the Museum's permanent collection, calling it "one of the best efforts of modern chair design." Likewise, Florence Knoll recognized its potential and added it to the Knoll line in 1947. Permanent collections: The Museum of Modern Art (New York), Fallingwater, Knoll Museum, Vitra Design Museum, Rose Seidler house. US production timeline: Artek Pascoe 1941-48. Knoll 1947-51. Circa50 since 1997. Circa50 clients: The Parker Palm Springs, Starlux Hotel, Thunderbird Hotel, Chelsea Hotel, Sunset Beach Hotel, Hotel San Jose, Hotel Indigo and others. Blog posts: Lifestyle Mirror. Design Milk. Life of an Architect. Modular Four. Modern in Denver. Apartment Therapy. The Brick House. Design Milk. Valet. MSN Glo, Western Cowboy Brands. The Design File. DesignWatcher. Remodelista. Media coverage: Martha Stewart Living (Sept 2011). Dwell (June 2011). Dwell. Elle Decor (July/Aug 2010). Dwell. Martha Stewart Living (March 2010). Boston Home (Spring 2010) 2009: Elle Decor. Dwell. Southern Living. Bonytt. Returns: We are confident you will be more than pleased with your purchase. If, however, you need to return an item for a refund or exchange, we accept returns within 30 days. Shipping rates in shopping cart apply to continental US locations. Indoor/outdoor vinyl weave is a Circa50 exclusive. This water resistant fabric is durable and easy to clean. To select a replacement cover for a vintage chair, measure your frame to determine the size that will fit best. All covers are made on demand, please allow 3 weeks. Click any swatch below for large view. The classic leather butterfly chair, our signature piece, is made one at at time, hand cut, and sewn with a coarse, heavy-duty thread. Available in one size, tailored to fit our frame. Haired markings are hand-selected for consistency and character, no two are ever alike. Click any swatch below for large view. We're proud of our top-quality materials: heavyweight canvas, vinyl weave and premium hides. Please select up to 4 samples. Our butterfly ottoman will complement your butterfly chair and other modern seating. Available in all fabric and leather options. Measures 17.5" high, 19.5" wide, 14.5" seat height. Ottoman with fabric cover, $250; leather or haired cowhide, $300. Matte black frame.